Obituary – Skinner, John Thomas « Perry High School Alumni Association, Inc.
﻿Basketball Mascot 45-46, Football Queen Manager 45-48, Band Queen Manager 45-47, Annual Queen Manager 46-48, Football Mascot 45-48, Wrestling Mascot 46-48, Assistant Business Manager of Annual 46-47, Business Manager of Annual 47-48, Who’s Who in American High Schools 48. 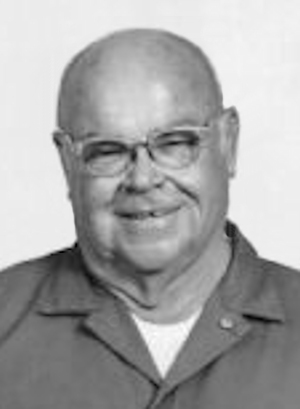 Brother John Thomas Skinner passed away on September 18, 2014, at the age of 85. Without a doubt, John was able to live so many years, due to the love and concern of so many people in his beloved home town of Perry. He truly loved his home town. John was born on May 8, 1929 on the Skinner homestead in Cleveland, OK where his grandfather, father and brother were also born. John Skinner started life out as any other young person in Perry, but when he was nine his life changed significantly. He became ill… and after several weeks of tests and dialogue it was determined that he had polio. He was one of the first in Perry to contract this devastating disease, and mostly likely one of the first in the state as polio had not yet reared its ugly head. After months of tests, isolation, hospitalization, surgeries, casts and braces, John was ultimately able to return to a more normal life. Always interested in sports, Coach Hump Daniels took a great interest in John and suggested that he become the mascot of the Perry High Football team. This single compassionate gesture by Coach Daniels gave John a new lease on life. A short time later the wrestling coach, John Divine, also requested that John take on the responsibilities of the mascot for the wrestling team. John accepted. These two extracurricular activities were highly valued by John and were perhaps the most important and meaningful of his school years. At one time, it was said that John had earned more athletic letters than anyone in the history of the school. Additionally, he was involved in other school activities and at the end of his senior year he was named “Most All around Student” of his class. As important as his school activities was his involvement in the national March of Dimes drive, which was to collect money in order to eradicate polio. The first year of the drive, Noble county designated that $150.00 would be their goal…and, through countless hours of personal contacts with various community people, students, going door-to-door…even meeting the buses that came thru Perry…he was able to attain that goal of $150.00. The following year the county increased their goal to $300.00….and once again the county’s goal became Johns personal target. Again, he achieved his objective. Every year throughout high school he continued working in the March of Dimes drive and during his senior year he personally collected over $10,000.00….a remarkable sum of money for those times. As a result of his tireless and determined effort, he received a personal thank you letter from President Roosevelt. Upon graduation from Perry High he was offered the very first scholarship as athletic trainer for the Oklahoma A and M Aggie football team. Leading the Cowboy football team in pregame calisthenics, and various other responsibilities, were amazing experiences for him. He was a well liked student and also had the honor of being elected President of the Freshman Class. After his freshman year he left college and became involved in several business ventures in Perry, and it was at this time that he became active in the National Guard. Because of his physical limitations he was deemed the moral builder for the Guard. When the 45th was activated to Ft. Polk, Louisiana, for additional training John accompanied them. At Ft. Polk he was often referred to as the biggest little General in the Army. When the troops shipped out to Japan and Korea he asked President Truman if he could go with them. The President wrote thanking him for his selfless dedication to the corps, but request was denied. After returning from Ft. Polk he worked at a variety of jobs, including being the maître d at the famous Beverly’s restaurant in Oklahoma City…a job he greatly enjoyed. 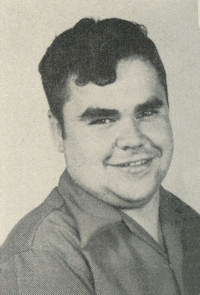 However, in his late thirties he made the difficult decision to return to college and he then attended the Vocational School at Okmulgee…where he graduated as the top student in his class. After graduation he got a job as office supply manager for the Tulsa Sears store and he remained there for many years. Sears began to eliminate most of their full-time employees in lieu of part time workers and John was one of their last employees to be terminated. Jobs were scarce, but John was able to hang in there…difficult as it was. In due course he was able to secure a position with the Sonic Drive In. He worked for them in a variety of jobs for several very satisfying years and it was one of the most favorite jobs. But, eventually John decided that it was time to go HOME….back to Perry. And return…he did…and he has never regretted his decision. After returning to Perry, he had a diversity of jobs…and also became something of an entrepreneur. Not at all surprising, he become very civic-minded…taking great pride in his hometown and working in many endeavors to make it a better community. Nothing gave John more pleasure than relating the many wonderful attributes of Perry and its people. Whether it was serving on the board at the Cherokee Museum, or soliciting contributions for various civic projects, or helping with the many town celebrations and parades…or elaborating about the good people that live in Perry, there can be no doubt that John Skinner took great pride in his hometown. Of the numerous accolades he received throughout his life time, none gave him more pleasure and satisfaction than being selected as a member of the Perry High School Alumni Honor Roll. He was the oldest child of Ralph and Vivian Skinner… long time residents of Perry, now deceased; the brother of Gaylord Wilson Skinner, deceased; and the brother of Lou Ann Skinner, who resides in Seattle, Washington. Other survivors are nephews Rick Skinner of Austin, Texas, Randy Skinner of Longview, Texas, and grandnieces, Taylor and Stevi Skinner of Austin, Katie Skinner of Longview, and great grandniece, Julie Skinner of Longview. Memorial contributions may be made to the March of Dimes or your favorite charity. Funeral services will be at 10 a.m. Tuesday September 23, 2014 at Grace Hill Cemetery Pavilion. Funeral arrangements are under the direction of BrownDugger Funeral Home.